How to accomplish RecordNavigationBar in the SfDataGrid like Syncfusion WindowsForms DataBoundGrid? The SfDataGrid does not support the RecordNavigationBar feature like the Syncfusion WindowsForms DataBoundGrid, but, it is possible to create the appearance and behavior of the RecordNavigationBar in the SfDataGrid by programmatically changing the SfDataGrid.SelectedIndex. 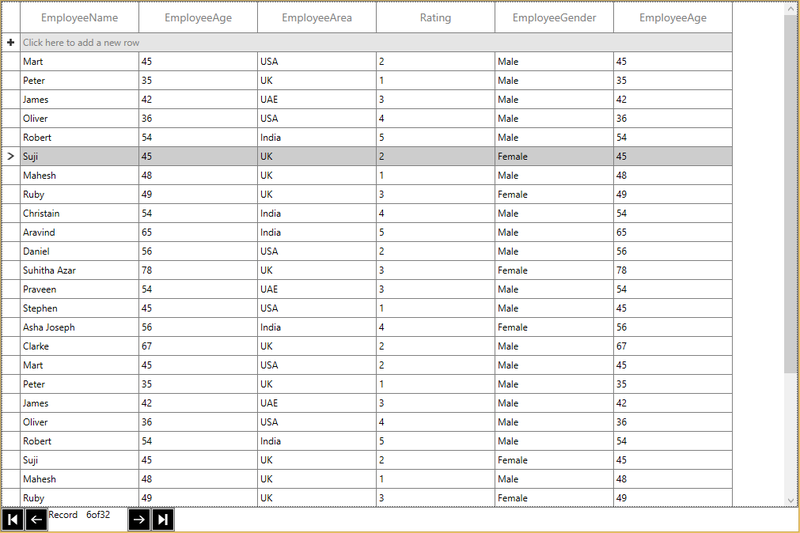 To select the previous row or the next row, the SfDataGrid.SelectedIndex value is incremented or decremented. This is demonstrated in the following code example. The first and last record selection can be done with the SelectionHelper.GetFirstRowIndex() and SelectionHelper.GetLastRowIndex() methods. Note: The SfDataGrid.SelectedIndex is brought into view by using the SfDataGrid.ScrollInView() method when it is out of view. The above code example is only applicable for the WPF platform. Refer to the attached example for WinRT and UWP platforms. The following screenshot illustrates the record navigation bar in the SfDataGrid.